Four artists explore medium and message in Echo Fields. Despite Marshall McLuhan's dictum that the medium is the message (alternatively, massage), style and content interact and collaborate in most works of art, though what is considered meaning changes over time. There are no easy answers (or crying) in contemporary art; each work is an arena echoing with the competing imperatives of past achievement and present possibility. (Besides, aesthetes and exegetes need to eat, too). Val Britton, Michael Meyers, and the artist team of Jennifer and Kevin McCoy explore how we encode and decipher meaning. 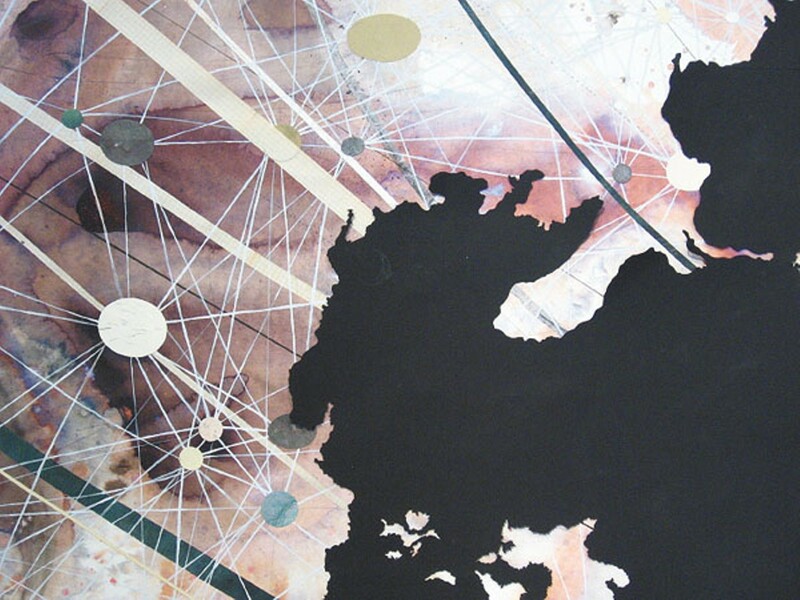 Britton makes abstract collages of drawn, painted, and stained paper fragments that are loosely based on a cartographic convention: organic, irregular forms juxtaposed with coordinates and meridians (often radial, as in ancient maps). The artist works intuitively with paper continents, clouds, archipelagos, and lakes, exploring time, memory, loss, and the restorative imagination. Works like "String Theory" and "Oceanic Drift" seem monumental because of their poetic mingling of realms — biology, botany, mineralogy, geology, meteorology, and astronomy — and their "floating world" transience. With all in flux, our attention drifts laterally across the page, or, due to the sedimentary layering, in and out of depth and time, in a cosmic zoom. While Britton explores the poetics of landscape, Meyers satirizes technological culture with his impeccably fabricated impossible machines and models. Duchamp, Tinguely, Aycock, and Oppenheim explored this territory, but their works mocked the absurdity of mainstream scientific-magical thinking with a certain ironic acerbity. Meyers' eccentric works seem less hortative; clearly made by hand, despite the computer design employed to work out their complicated geometries, they verge on a curious faux nostalgia. In "Antique View" Meyers' trademark squashed horn/ear trumpet hangs from a crown of pulleys, stabilized by a counterweighted concrete core-sample cylinder set within a sort of balloon gondola or bird feeder. "Monoculus" is a cascade of hinged cylinders, their wire-frame faceting suggesting Corinthian columns; they seem to have fallen from atop a wooden ball, the traditional perch of allegorical figures symbolizing fickle Fortuna. 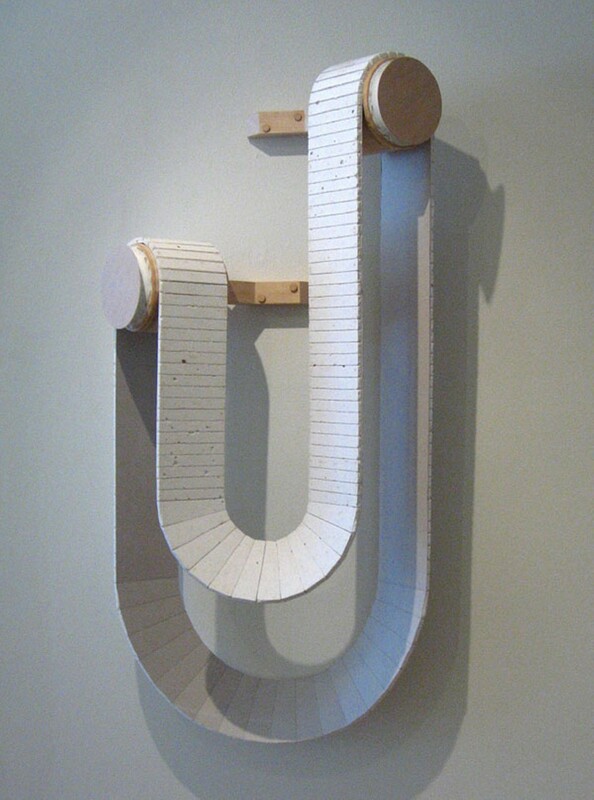 "Room over Realm" and "Ribbon Road," with their belts (or tank treads) made from scored strips of Sheetrock, recall the huge leather belts driving machinery in 19th-century water-powered factories.